This is an ebook, I've written. It's approximately 200 pages (55,000 words; well Amazon says 328 pages) with lots of diagrams, pictures and short source code listing. All source code from the book is on Github. 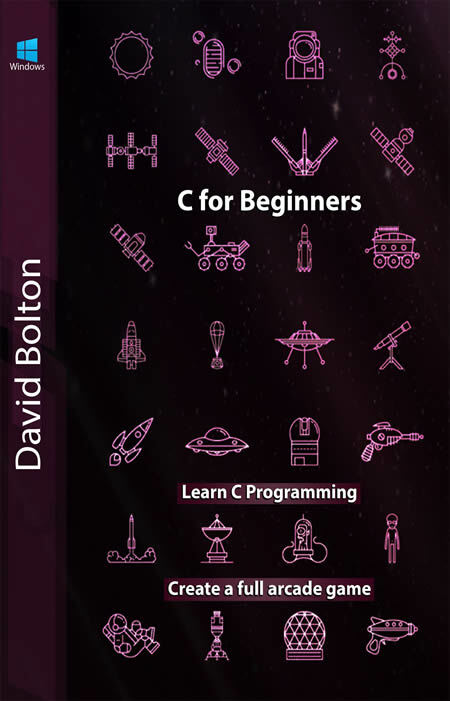 The first 20 chapters introduce you to programming in C with 30 example programs. This includes showing you how to install Visual Studio and compile and run programs. Subjects taught include a large chunk of C including variables, loops, structs, arrays, chars, functions and pointers. You'll learn about typedef and pick up a few tips on programming and debugging along the way. And there's lots more. This is about developing a full blown asteroids game, with asteroids, player ships, bullets etc. usingthe SDL2 library to get 60 frames per second action using what you learned in the first 20 chapters. It builds up with new code added in each of 13 chapters, culminating in a full game around 2,200 lines of C. This includes a fast pixel-perfect collision detection algorithm. Along the way you'll learn how to display graphics at 60 frames per second, play sounds, handle the keyboard, display and update a high-score table and lots more. It's currently being polished and should be ready for launch on Amazon in December 2018. When the book is ready, I'll post a link here. What’s a signed number in hexadecimal? How big are variables of a specified type? Testing for equality but using = instead of ==. What is a void function? A few notes on functions. You don’t need a return in a void function. What does that mean? Double buffered? Files for this Chapter How does timing work? What is an Escape Char? How long is a frame in time? How do the masks work? Why do we add an object to cells? Adding an object to a cell? Adding a pointer into a list of pointers in a cell. How many cells does an object cover? Why are pointers so important? How much processing time does it take? When is a function not a function? A big thank you to limaker for helping with a tedious task!